Yesterday I was talking to my mom on facebook and she mentioned that two of my sisters were picking figs at my aunts’ house. My Aunt Zoe has three beautiful fig trees in her yard. Not to mention she also has peaches, plums, pineapple and blueberry plants in her yard. Sad thing though is that most of my family, like my aunt, are in florida and I am across the country in Washington. I told my mom that I was a little jealous that they could pick figs right now. I love figs! In reply she said she would mail me some! I’m in shock that people can actually mail fruit. I did look it up just to make sure it was correct and sure enough USPS document C022 states: “Mailable perishable foods that do not rapidly decay or generate obnoxious odors in the mail may be sent at the mailer’s risk.” That made me laugh. Someone on yahoo answers wanted to know if he could random fruit, like a banana through the mail without a return address so that he could confuse one of his friends. 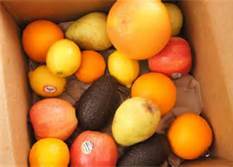 For you, me and everyone else out there, yes you can mail fruit. Just make sure it’s packaged well, won’t spoil quickly and marked as fragile. This entry was posted in Facts and tagged facebook, fig tree, figs, Florida, food, fruit, mailing fruit, mom, nature, plants, USPS, Washington. Bookmark the permalink.